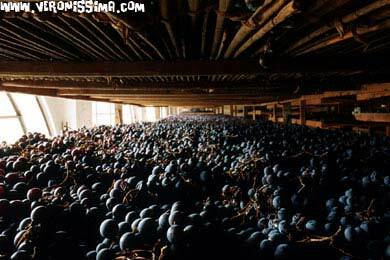 Grapes that will be used for Amarone production are drying in special lofts above wineries in Valpolicella wine producing area. It took three years and all the techniques made available by modern biotechnology for the researchers of Verona University to unveil the genetic secrets of the most important grape varietal used for the Valpolicella and Amarone wines: Corvina. This genome sequencing comes just three years after the University of Verona decoded the genome of the 40024th Pn, an experimental clone of Pinot Noir. Many international grape varieties in fact had already their genes sequenced but it's the first time that an autochthonous grape variety such as Corvina, evolved in hundreds of years to perfectly adapt to Valpolicella territory, has its DNA fully analyzed. No other country in the world has as many autochthonous grape varietals as Italy. Grape has been grown since the ancient Greek colonization of Southern Italy and the Romans, with a full scale selective breeding, developed several new varietals identifying different areas of quality growth and matching specific grape varieties to their ideal growing conditions. These grapes varietals are the ancestors of grapes grown today in Italy. Valpolicella has been a renown wine producing area since Roman time, and there are written documents from the 6th Century AD, proving the existence of a sweet wine produced in Verona territory using half dried grapes. This sweet wine which today is still bottled in Valpolicella is probably the Recioto, from which the Amarone derives. The research of Verona University has also helped to understand how the four months drying process, from September until January, undergone by Valpolicella grapes in order to produce the Amarone, is not just a simple dehydration but is a definitely more complex process, activating more than 415 genes that controls the metabolism of the grapes and activate the production of secondary flavours and aromas typical of the Amarone. Beta amirina sintasi, strictosinidina, delta cadinene sintasi, these are some of the genes that gives Amarone its peculiar flavours such as liquorice. There is in fact a small portion of a similar genome both in Pinot Noir and in the Corvina, but in Pinot Noir this remains inactive while in Corvina is perfectly funtioning and activates during the drying, helping completing the ripening and developing the typical aromatic complexity of the Amarone. There are many reason for such researches to be conducted on traditional Italian food and wines. The use of DNA maps for example can probably help detecting food and wine frauds. The worldwide business of fake Italian food is a big issue for the country, costing its economy between €50 and €100 billion annually. The total value of all food and beverage produced in Italy is estimated at €119 billion annually. The Italian Farmers Union Coldiretti has already asked that Italy’s 355 native vines be safeguarded by having their DNA mapped. Coldiretti expressed their concern about China plans to map and collect genomes from around the world and gathering a major technological advantage in copying and using them for commercial pourposes as it is already happening world wide for Italian fashion brands. The Beijing Genomic Institute, the leading Chinese research center has announced its plas to sequence a thousand genomes (500 animals and 500 plants) within the next two years thanks to a $100 million grant. According to the University of Verona, the fear is that China will use DNA information to manufacture Italian foods that appear to be authentic. Some Australian wine makers are already selling a wine named "Amarone method" thus creating great confusion in consumers and a damage to the image of the original Valpolicella Amarone. Even among wine enthusiasts there are people who started believing that Amarone owes its characteristics just to the drying process undergone by the grapes and can be made with any type of grape, grown anywhere. The drying method, appassimento in Italian, is widely used in many other Italian wine producing regions, mainly to produce dessert wines, passiti. The research of the University of Verona demonstrated how there are many factors, not just the drying, involved in the production of the Amarone, first of all the grape variety, its genes and how they adapted to a specific territory, its soil, its climate. This is also confirmed by the fact that the same grapes, grown only few kilometers from Valpolicella, create a totally different wine, the Bardolino, a light, fresh and fruity red wine. For those who wants to know more about Valpolicella and Amarone, Veronissima offers many types of winery and wine tasting tours. You'll have the chance to visit Valpolicella vineyards, the traditional cellar where the Amarone ages and to discover some of the secrets that makes this territory and its wines so special.